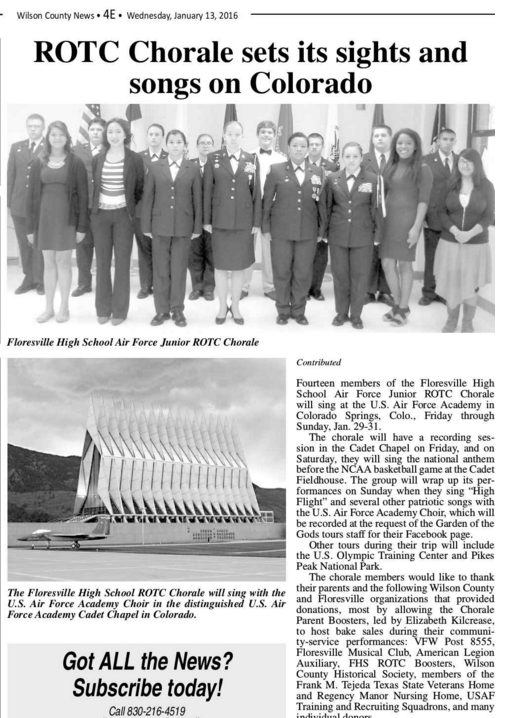 "FHS ROTC Chorale to Sing at USAF Academy"
Fourteen members of the FHS ROTC Chorale will sing at the United States Air Force Academy in Colorado Springs, January 29-31. After fund raising to pay for their airline tickets, the Chorale members would like to thank their parents and the following Wilson County and Floresville organizations that provided donations, most by allowing ROTC Chorale Parent Boosters, led by Mrs. Elizabeth Kilcrease, to host bake sales during their community service performances: VFW Post 8555, Floresville Musical Club, American Legion Auxiliary, FHS ROTC Boosters, Wilson County Historical Society, members of the Tejeda Veterans Home and Regency Manor Nursing Home, USAF Training & Recruiting Squadrons and many individual donors. The Chorale will sing the National Anthem before the NCAA Basketball game at the Cadet Field house, Saturday evening, Jan 30th. Friday afternoon they have a recording session in the Cadet Chapel and Sunday morning they will sing High Flight and several other patriotic songs with the USAF Academy Choir. At the request of the Garden of the Gods tours staff for their facebook page, they have asked to record High Flight. Other tours during their trip will include the U.S. Olympic Training Center and the Pikes Peak National Park. 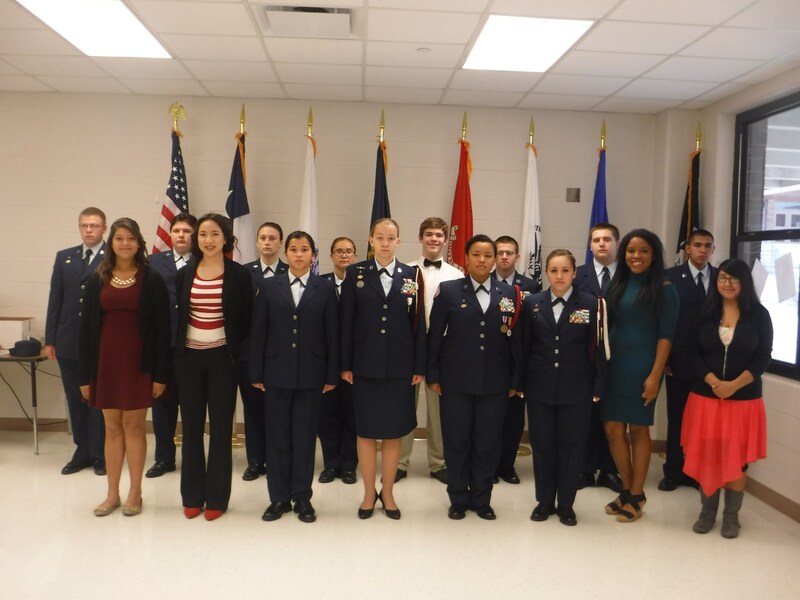 Photo #1: Members of the FHS ROTC Chorale (not pictured are Joshua Ibrom and Chloe Talamantez). 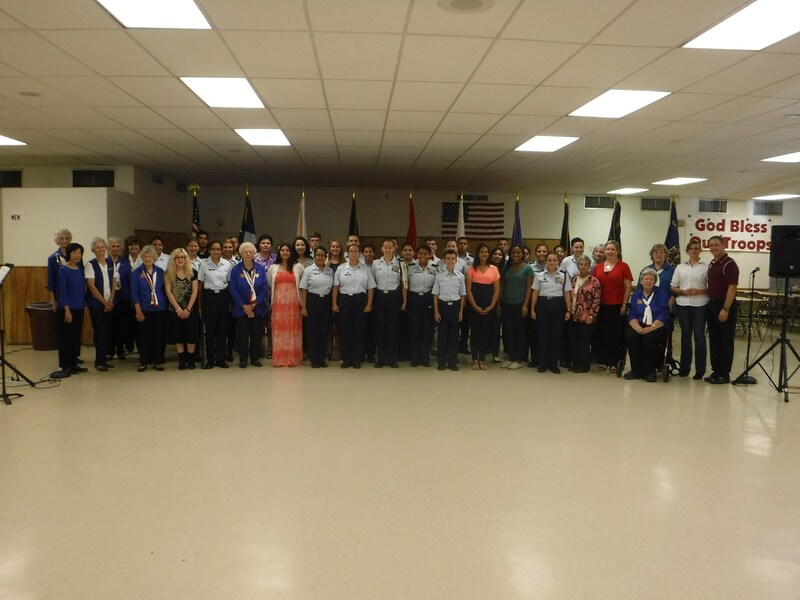 Photo #2: VFW Post 8555 Auxiliary hosted performance and bake sale. 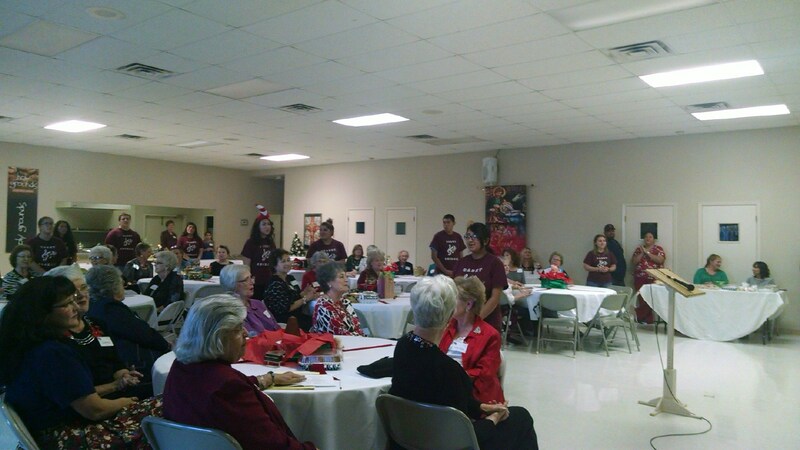 Photo #3: Floresville Musical Club hosted performance and bake sale. 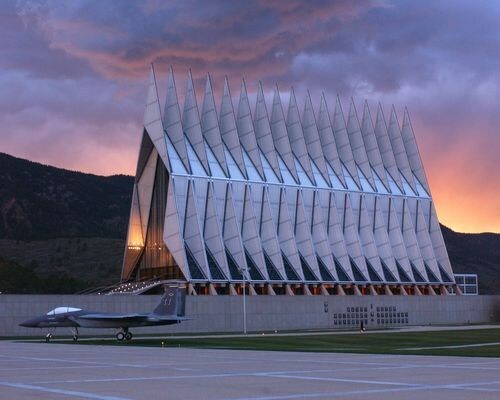 Photo #4: USAF Academy Chapel where the FHS ROTC Chorale will sing with the Academy Choir.